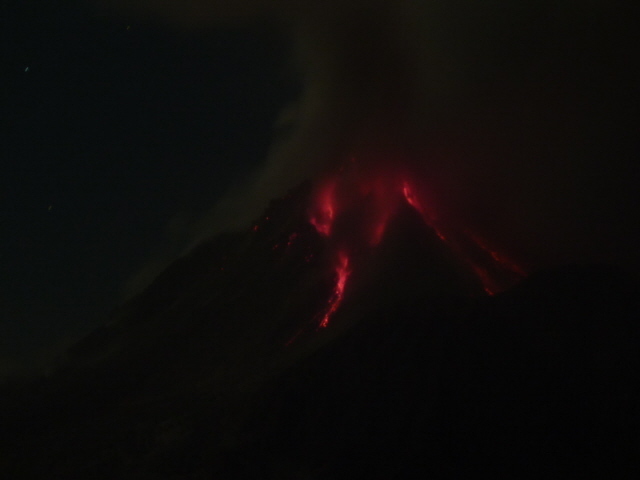 A volcanic island in the Caribbean, whose former capital city of Plymouth was turned into a "modern-day Pompeii" by Montserrat's Soufriere Hills volcano from the mid-1990s. Since then, only the northern third of the island has been inhabitable. The volcano remains active, at varying levels. At times this can make for spectacular volcano viewing, e.g. from the dedicated volcano observatory. During periods of less activity, on the other hand, there may be fewer restrictions on viewing/visiting the destroyed settlements of the south. This makes Montserrat currently the prime destination for the dark tourist in the whole of the Caribbean. More background info: Montserrat, a British overseas territory in the eastern Caribbean, was (and stubbornly still is) referred to as the "Emerald Island", in reference to both its lush green vegetation as well as to the high proportion of settlers from Ireland in earlier colonial times. … first in the form of Hurricane Hugo in 1989 – then in the summer of 1995 the island's volcano Soufriere Hills, which had been inactive for hundreds of years, suddenly awoke. Initially it only vented steam but soon became more violent – including explosive eruptions, pyroclastic flows, heavy ashfall and subsequent lahars (volcanic mudflows after rainfall). The island's capital city Plymouth on the south-western coast had to be evacuated, at first only for limited periods, but eventually it had to be abandoned for good in 1997. It was hit by not only ashfall but also pyroclastic flows which set buildings alight and bent steel girders. 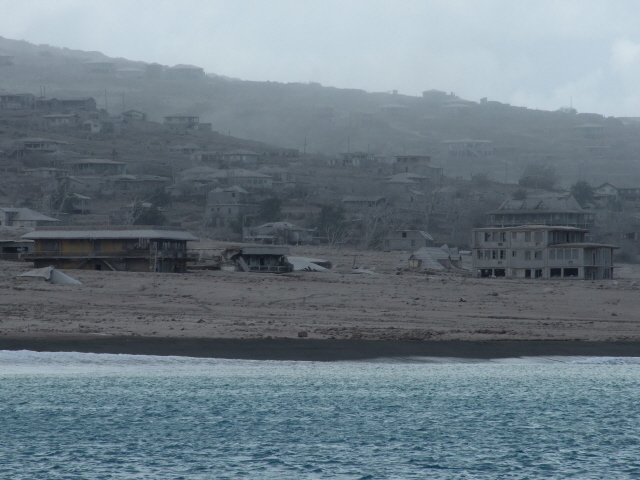 Continuous lahars have since contributed to the gradual burial of the once thriving centre of life on Montserrat. It is now a "modern-day Pompeii" (they do call it that even in the mainstream tourist brochures!) – and thus is the main draw for the dark tourist (see below for – often heavily restricted – access). That does not mean, however, that the volcanic devastation on Montserrat did not cause any deaths – it did, when on 25 June 1997 nineteen people were killed on the eastern side of the island. That day a particularly violent explosive event sent pyroclastic flows and surges down the river valleys and over the slopes on to formerly fertile farmland and smaller settlements. Nominally, these parts of the island had already been in the exclusion zone, but some people were still trying to farm their land or tend to their properties and livestock. In part this was out of economic pressures. But there may also have been a degree of complacency that set in as people got used to the normally quite regular and predictable activity of the volcano at that time. The volcanic events on that day, however, happened very quickly and initially silently. That's another thing about pyroclastic flows: destructive as they are, they hardly make a noise that could give forewarning. Still, the flood of hot gas and ash scorched vast tracts of the land and reached as far as the island's airport right on the coast. Of the assumed 19 victims many were covered under thick layers of volcanic deposits and their bodies could thus not be recovered. Those that were found were severely burned, even charred – demonstrating the intense heat of the flows – others were even dismembered by the force of the flow that engulfed them. Fortunately, these were the volcano’s only fatalities. 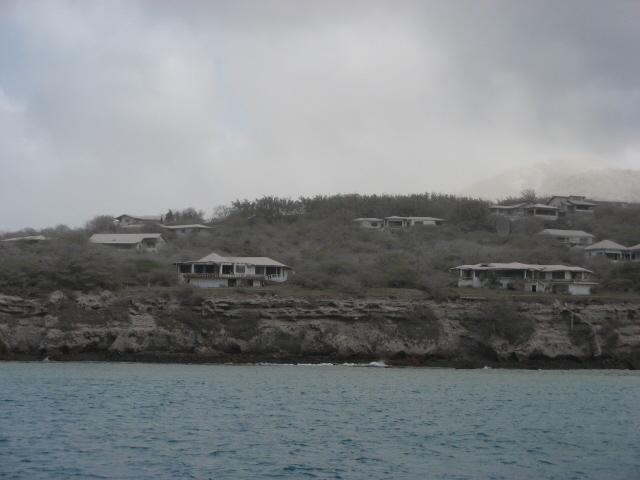 But the devastation it caused to the island's economy was enormous and affected almost everybody on Montserrat. 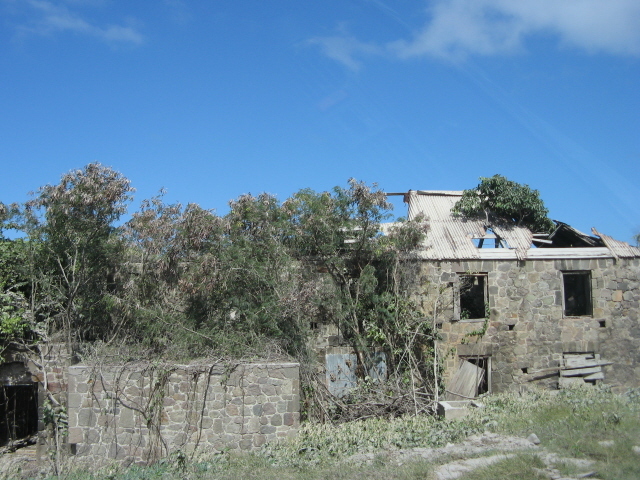 About two-thirds of the island's territory had more or less become uninhabitable, including the economic centre and most of the farmland. The people were at first evacuated to the safer northern parts of the island. Those who could not stay with relatives had to be housed in temporary refugee camps … cramped living conditions and no jobs meant that almost two-thirds of Montserrat's ca. 12,000 inhabitants (as in pre-volcano 1995 figures) didn't see any future on the island any longer and eventually left altogether. Thus many Montserratians relocated to neighbouring islands, the USA or especially to Great Britain – where they were eventually granted full citizen rights (as the island is British). Large sums in aid have been pumped into Montserrat, but only few refugees have come back to live on the island again permanently. Population figures are now at no more than 5000. However, many of the Montserratian "diaspora" retain strong ties with their home island – and return on visits, especially for the festival season between Christmas and New Year. The volcano has remained active since the cataclysmic events of esp. June 1997. 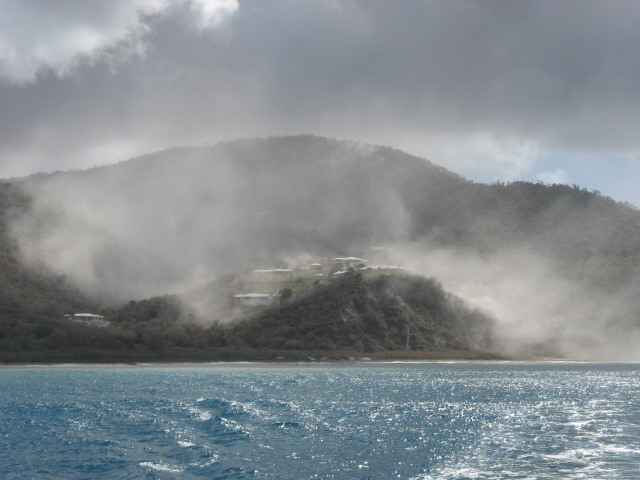 A presumed lateral blast caused a massive eruption and flow down the western side of the island on 26 December 1997, completely wiping out settlements just south of Plymouth. The volcano then went into periods of relative calm, punctuated by phases of increased activity with continued pyroclastic flows, ash plumes and gas venting. The dome of the crater kept growing again and in 2003 reached its highest ever, even surpassing the until then highest point on the island. Then in July 2003 it blew its top in a dome collapse that is considered the largest ever observed in recorded history. The pyroclastic flows generated by this event travelled out east on to the coast and over the sea, where their deposits created more new land. 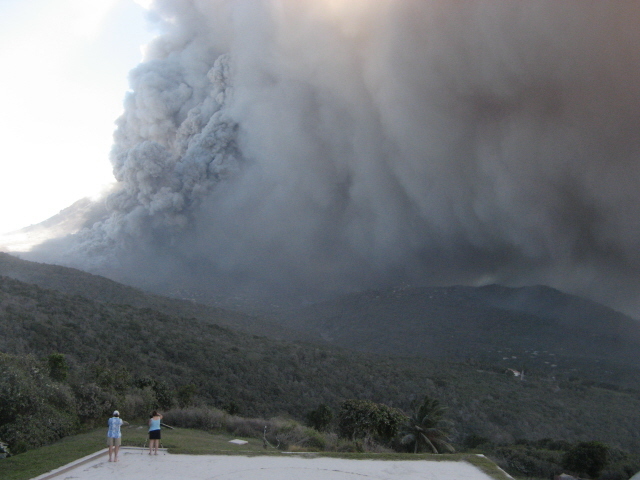 By the way, it was on Montserrat that the ability of pyroclastic flows to travel even over water had been observed (and filmed) for the very first time. It had always been assumed that this is what had happened at Krakatoa, but it had never before actually been seen. Even the video footage is indeed a frightening sight – live it must be even more heart-stopping. Volcanic activity resumed in more recent years after another period of mere minor grumbling and gas venting. It kicked off again from October 2009. 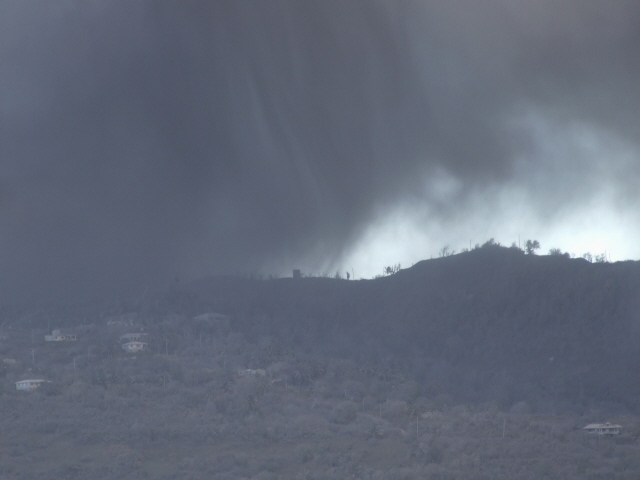 Resumed dome growth has been observed and regular pyroclastic flows returned, so that the hazard level had to be raised yet again and some parts of the central zones declared off limits by the Montserrat Volcano Observatory (MVO). That this was indeed for good reason was demonstrated in January 2010 when some pyroclastic flows reached almost as far as the former Air Studios, and a subsequent one even reached all the way down to the sea just south of Plymouth, where it swept away or buried even more of what had remained of the abandoned housing there. And then in the first half of February, dramatic explosive events and a partial dome collapse further underscored the threat from the volcano. Extensive pyroclastic flows have covered more land (and the old airport – see below) and the deposited material was still steaming for weeks. The volcano continues to be a hazard – and a nuisance also for those inhabitants living north of the total exclusion zone. 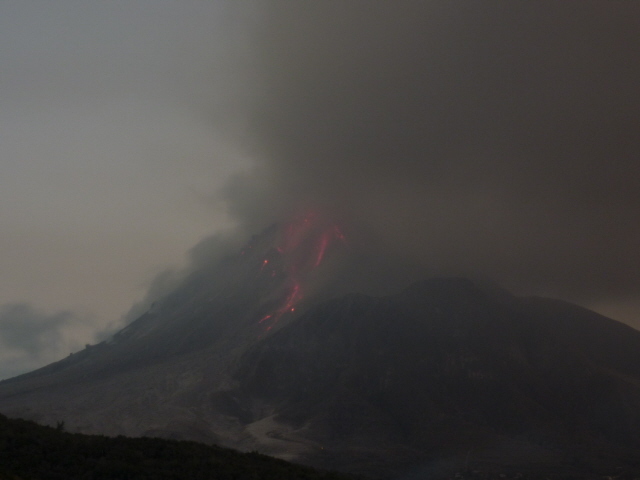 There are inhabited areas at Belham Valley which may have to be evacuated at night (as the scientists say they can't monitor the volcano as well in the dark – cf. under MVO). For the visitor, on the other hand, the ash may be a little bit inconvenient, but the viewing opportunities of either the volcano's previous devastation (esp. Plymouth) or the spectacle of actual activity going on, outweigh all this. Indeed, the volcano is one of the prime draws for visitors to this island, not just dark tourists, but esp. numerous hobby volcanologists. For the real, professional volcanologists, Montserrat's Soufriere Hills is of course a prized study object in any case – it's a complex, predominantly andesitic volcano of comparatively regular activity which can be studied fairly close up from relative safety, also given that the volcano isn't as big as some of the more dangerous monsters of a similar type found e.g. in Japan or the Philippines. What there is to see: what you can see at any given time is pretty much at the mountain's mercy. When it's very active, volcano viewing can be dramatic, but then access to most zones closer to the base of the volcano will be impossible. When it's less active, you won't get the spectacular volcanic show, but you may be able to get closer or even into the prime dark attraction of the island: its former capital city Plymouth, now a ghost town covered in 30 to 40 feet / 10-12m of hardened ash and lahar mud. It's one of the eeriest places of its kind. In fact, the town gets buried more and more every year – some features seen on older footage, such as the top of the cathedral steeple still poking out of the grey wasteland, have by now disappeared completely, as successive layers of volcanic deposits grow in thickness. Many houses still stick out – only what appears to be a two-storey house is often a half-buried five-storey house. Since everything is grey from the volcanic ash, images of Plymouth tend to look like black-and-white photos even if they're colour. It's a totally eerie and apocalyptic sight to behold – currently one of the most dramatic ghost towns on the planet! As the skipper of the boat I was on to see Plymouth from the sea put it: going into Plymouth is "like walking into a Mad Max movie set". However: normally you can't actually walk into it. Access to the ruins of Plymouth is severely restricted because of the level of volcano activity. It allegedly used to be possible years ago to just wander in on foot … and no one would have cared. Even though strictly speaking the legality of such spontaneous hikes into the exclusion zone may have been questionable even then. To be allowed in officially you could apply for a permit from the authorities and even be allocated a guide (for a price). But none of this has been possible for many years now. Not even the scientists have ventured into Plymouth on the ground any more for while. The best one could hope for at such times is getting a good glimpse of Plymouth from some viewpoints, esp. from Garibaldi Hill just above the town to the north (accessible by 4x4 car or a serious hike). But even that can be declared out of bounds when the official hazard levels are set higher. The same applies to the deserted former Air Studios, which also lies inside the sensitive zones. 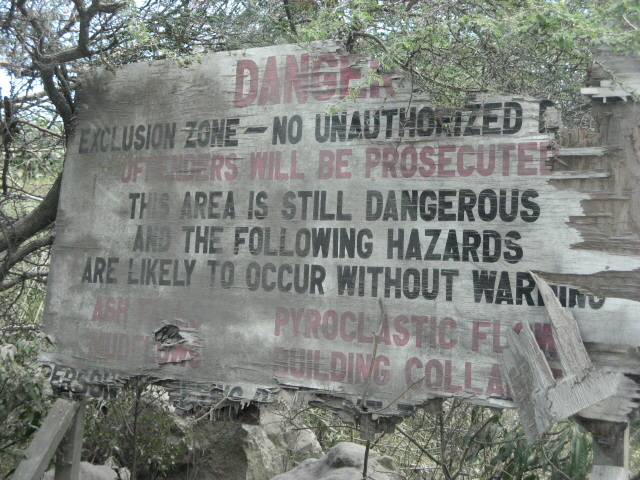 This was in fact the case when I visited in December 2009, when hazard levels were at the second highest level and there was no access to any of the various zones in the southern part of the island, except for Zone A, which is still widely inhabited and which is where the Montserrat Volcano Observatory (MVO) itself is located. Outside, from the MVO's position on the hillside right opposite the volcano, not only the crater itself is visible (if it's not shrouded in smoke and/or clouds), but also parts of Plymouth down on the coast … you can't make out much detail from up here but you can see the monochrome outline of houses poking out of an ashen grey slope. Alternatively, you can go on a boat trip to see the deserted town from the sea. Such boat trips are available from the Dive Shop at Little Bay (they also run the Green Monkey bar – and, naturally, also offer diving and snorkelling). How close you may actually get to the coastline, again, depends on current activity levels, but you'll still get a much better impression than from up on the hill. It was also here on the eastern coast where the island's original airport was located. 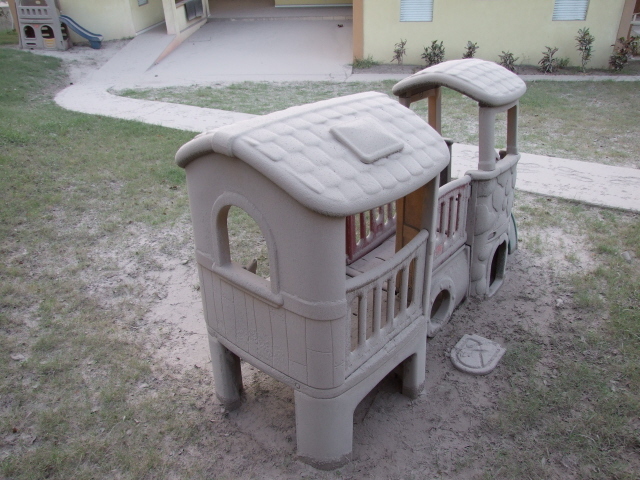 This too was destroyed by the volcano. Until recently you could see the shell of what used to be "W.H. Bramble Airport's" terminal building and about half of the former runway from a special viewpoint at Jack Boy Hill (signposted) or from a ledge a bit further down the road just before you come to the gate to the exclusion zone (see photos). When I was there in December 2009 there was even work going on further down the hill – namely gravel extraction (the volcanic material is apparently good for making high quality concrete) – so it can't have been considered that dangerous down there all the time. Tourists, however, were not normally allowed beyond the gates. All this has changed now anyway – the partial dome collapse on 11 February 2010 which resulted in massive pyroclastic flows towards the north-east – yet again – changed the landscape. I've been told that now the coastline's been extended by new land by a couple of hundred yards and that the remains of Bramble Airport are buried and gone. 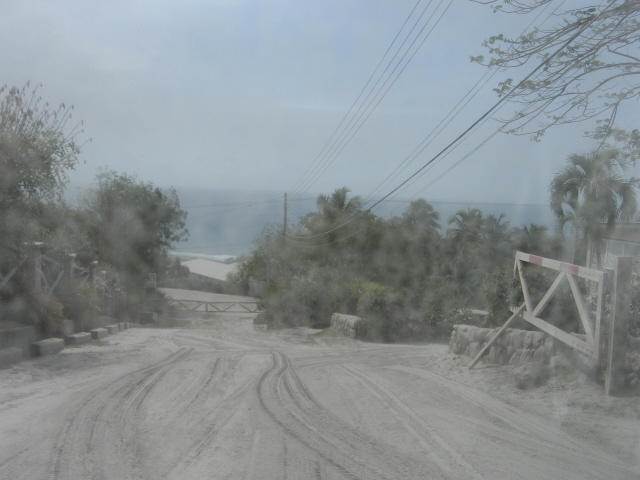 The rest of the northern third of the island that is freely accessible doesn't contain much of particular interest to the dark tourist, unless, of course, there is ashfall – as when I visited in December 2009 – when even parts of the north can get covered in ash. This in itself provided a kind of eerie atmosphere, esp. where the ashfall had been heavy, which was the case in particular in and around Salem. Other than that, there may be volcano-related exhibitions at the National Trust building just by the main road near Salem. When I visited there was a small selection of, in part, touching and dramatic photographic images on display that were taken in the late 1990s. But even without any exhibitions it's worth popping by – they also sell volcano-themed souvenirs. One more thing needs to be mentioned: the most extravagant (and expensive) way of seeing Montserrat, including the normally closed-off devastated parts, especially Plymouth, is from the air – by flyover in a light aircraft, or better still, by helicopter (see under access). For such flyovers you wouldn't even need to set foot on the island at all, as you can do them from neighbouring Antigua – but you have to ask yourself whether that could replace seeing the volcano, Plymouth and other parts of the island from viewpoints at your leisure rather than under time-pressure within just a few fly-by minutes. On flyovers you'd also miss out on the chance of some really worthwhile volcano observation from a stationary vantage point. Another thing to remember is when ash is being ejected by the volcano, there may be severe limitations on where flying is possible. Plymouth, lying on the western side of the island where the normally prevailing winds blow the ash clouds, may often not be visible at all from the air – so make sure you check ahead before booking any such flights! Moreover, with no more than a flyover you'd also miss out on the splendid experience of a peaceful, open and friendly island "the way the Caribbean used to be", as they like to say here. No crime, everybody is friendly and welcoming, relaxed and cheerful – despite the hazards and hassles that the volcano brings … in fact, even the local music is full of an almost sarcastic, black-humoured way of coping with this (e.g. with ashfalls, shovelling roofs free of ash, preparing for evacuations, etc. ), all set to chirpy calypso or soca music! That's pretty unique too … so do go and stay a while on the island! Location: Montserrat is part of the Leeward Islands chain of the Eastern Caribbean's Lesser Antilles; its closest neighbouring island is Antigua ca. 30 miles (50 km) to the north-east. Further neighbours include Nevis and St Kitts to the north and Guadeloupe to the south. Access and costs: not so easy to get to but not necessarily too expensive once on the island. Details: Getting to Montserrat is a bit tricky – there's only a small airport served by a couple of regional airlines, including one based on Montserrat itself (called FlyMontserrat). Most visitors will have to go to Antigua (served by several international airlines) to catch a connecting flight from there. At between 150 and 300 USD (plus departure taxes) these don't come cheap, esp. in relation to the short distance that the 20-minute hop to Montserrat is. The only alternative is the ferry service that has been recently revived. At a bit over 100 USD return, this is the cheaper option – but: heavy seas may make the crossing impossible … and in particular the landing at Montserrat's basic jetty at Little Bay. There may be only one crossing per day, often two, one morning, one evening, and some days there may be no service at all – check the current schedule e.g. 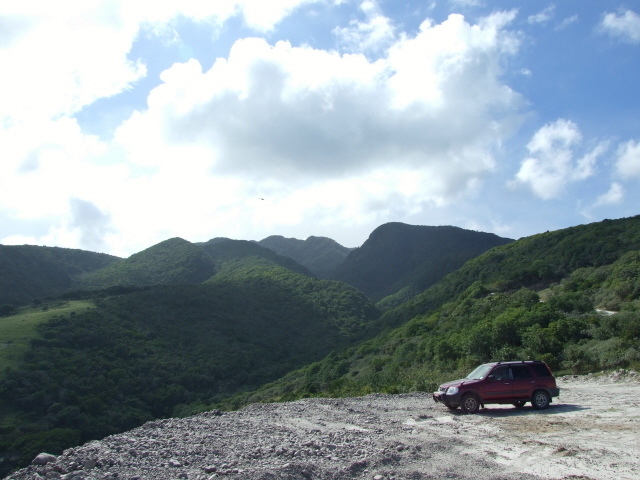 on www.visitmontserrat.com >getting there; for short-notice information phone (664) 496 9912 in Montserrat and (268) 778 9786 in Antigua. 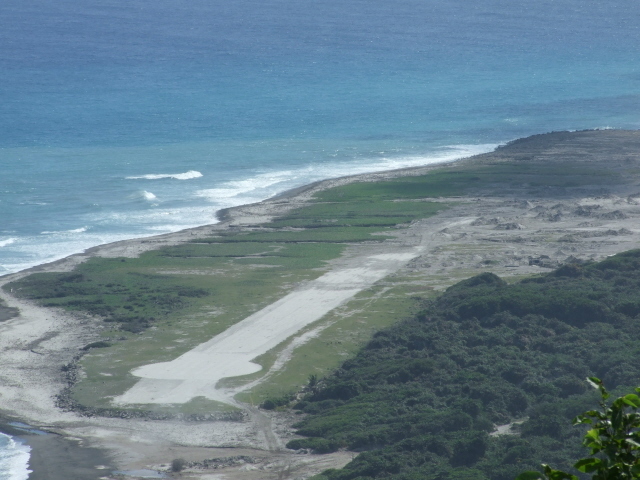 Note that flights aren't guaranteed to take place either – when I visited in December 2009, the airport on Montserrat (that is: the new one, which was opened in 2005, not the destroyed former W.H. Bramble Airport, of course) was temporarily closed due to ashfall from the volcano. Such ash is highly dangerous for aircraft engines, so for safety reasons they shouldn't get anywhere near it. First I was told to stick it out and wait for the ashfall to ease down. But eventually I had resort to plan B and take the ferry at extra cost (forfeiting the air ticket) – at least the sea crossing was possible. If you don't (or can't) actually set foot on the island, one way of at least just getting a brief glimpse of Montserrat, its volcano and the devastation it caused is by a flyover, in particular by helicopter. Such helicopter excursions are offered by Caribbean Helicopters from Jolly Harbour, Antigua, on a regular basis. It's a bit of a luxury at ca. 240 USD per head. Helicopter charters are also possible, but obviously cost even more serious money. FlyMontserrat also offer flyovers by small aircraft – if you can get a large enough group together, this can push the price per person down (when I last checked they wanted 400 USD for a 15-minute flight, from Montserrat's airport – phone +664 491-3434 to check/negotiate). Getting around on the island of Montserrat is best by hire car – there is a bus service, but that won't get you to the points of most interest to the dark tourist … and taxi fares would quickly build up far in excess of the costs for a hire car. For shorter distances you can also hitchhike – or rather: locals who pass people walking along roads will often spontaneously stop to offer a ride. It's safe, really just genuine friendliness – so don't hesitate to accept. But of course this too is of limited use for targetedly getting around to the points of most (dark) interest. So, one's own hire car is best. Often accommodation arrangements (see below) offer the option of booking a rental car with it, otherwise the tourist board can point you in the right direction (check visitmontserrat.com >getting around). 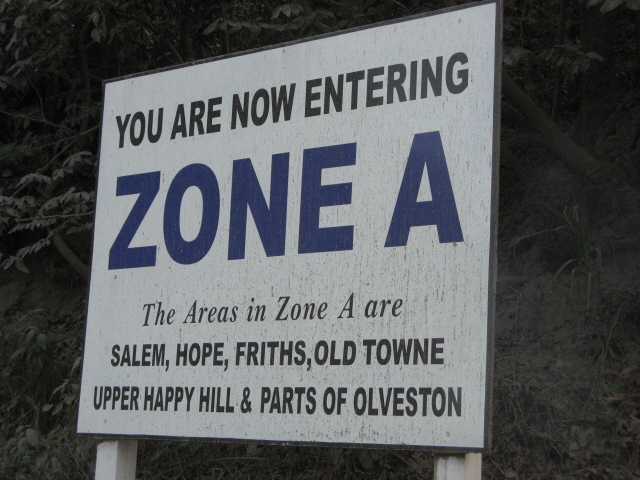 There's only one main road winding its way from the northern settlements, including the temporary administrative "capital" Brades and the new town developments at Little Bay and Lookout, to the southernmost still inhabited parts (Salem, Olveston, etc.). Side streets branch off this, including the one to Jack Boy Hill viewpoint and to the Montserrat Volcano Observatory (MVO). Navigation is thus fairly easy – I only got lost twice and was quickly alerted to it by locals by the roadside. Driving is on the left (the island is British, remember) and generally slow and safe. You do encounter the odd driving maniac (even in sports cars that are totally inappropriate for the island's roads), but overall it's all very relaxed. Some stretches of roads, though, are quite steep and twisting, though it's manageable. Some more remote parts may be easier to access with a 4x4 jeep. Note that you will have to purchase a temporary driving permit from the police, which costs ca. 20 USD! 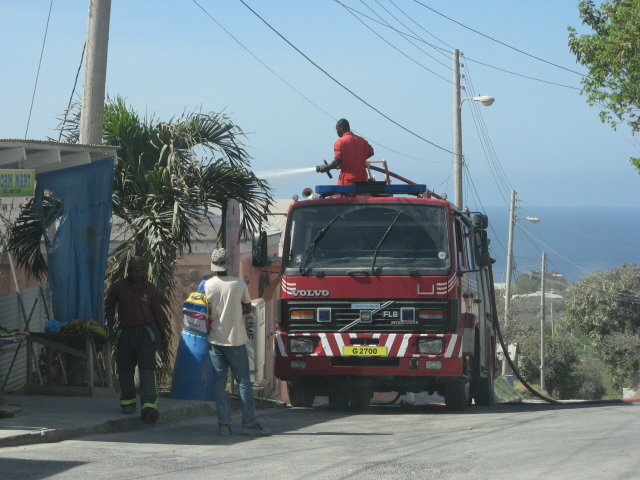 Speaking of police – its presence may soon feel rather disproportionate, given that Montserrat is virtually crime-free. People tend to never lock their houses or cars – it's quite normal to even leave the ignition key in when you park. Police are, however, also present to enforce the road blocks at the points of entry to the exclusion zone. And it really is illegal to enter these zones! So don't try and sneak in … it's illegal because it is dangerous! 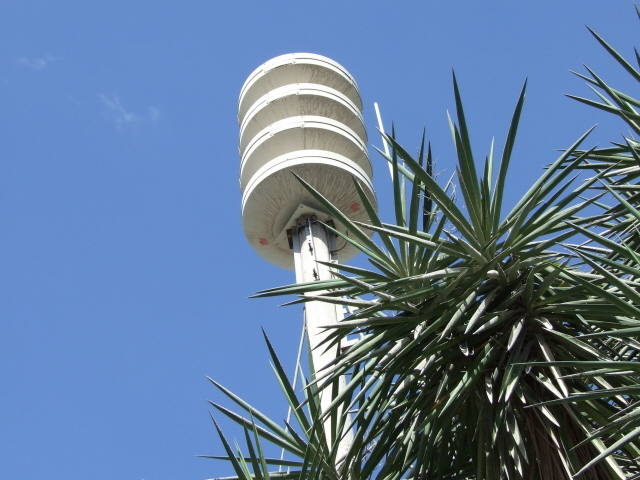 You can check on the MVO's website (mvo.ms) what the current hazard level is – after the dramatic period of October 2009 to February 2010 the level was lowered again to 3 or 2, so probably more parts of the island can now be accessed. But most of the southern half of the island including Plymouth remains out of bounds. Accommodation options on Montserrat may lack the range and luxury you get on other Caribbean islands, but on the other hand prices are generally much more affordable! 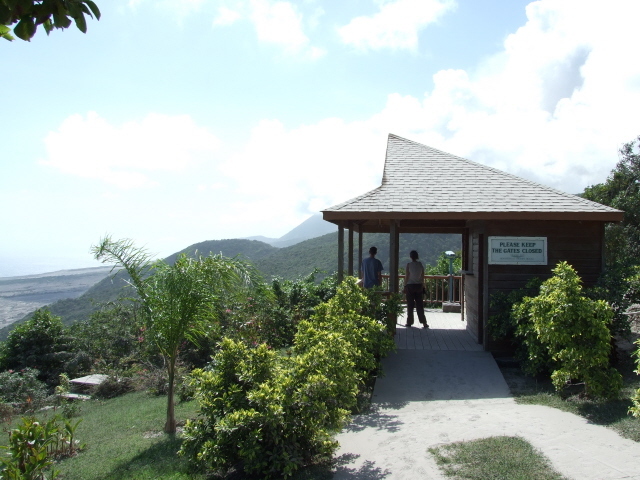 Many of the relatively few tourists that make it to Montserrat rent villas on a weekly basis – of which there are quite a few. Some self-catering places are also available on a daily rate basis. There are a few guest houses/B&Bs too, but just one fully-appointed hotel. While the latter may look great on paper, and in pictures, it does feel a bit out of place on Montserrat, even a bit soulless. Prices range roughly from 30 to 160 USD per night (plus taxes). For an overview check out visitmontserrat.com. My personal recommendation for a self-catering place to stay at is Gingerbread Hill (www.volcano-island.com) – this is run by the family of Montserrat's "Mister Volcano" himself: David Lea, who shot much of the video footage you may have seen of the Soufriere Hills eruptions, pyroclastic flows and the images of devastated Plymouth (see preparation). Gingerbread's accommodation options range from the simple and cheap backpackers' room to the gorgeous Heavenly Suite (with a great view). They can also arrange guided island tours and/or rental cars. Time required: In theory you won't need all that much time to tick off the points of interest (dark or otherwise) that Montserrat has to offer, maybe just a couple of days – but it pays off to have plenty of time to play with rather than rush through the sights. Esp. when there is volcanic activity, which is never really predictable, you will want to make several trips out to the viewpoints (esp. 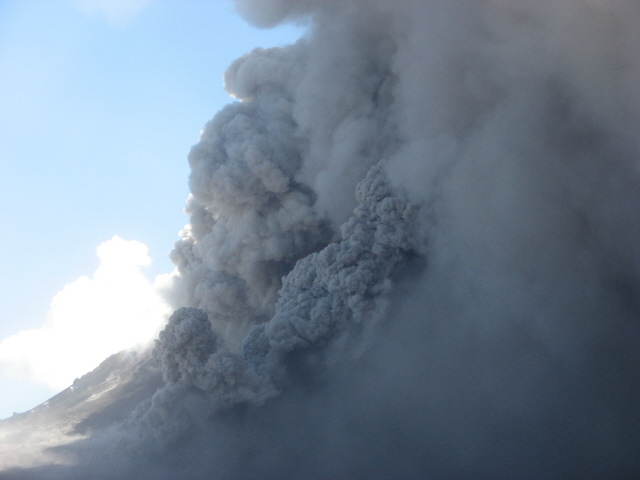 the MVO) to increase your chances of being able to witness eruptions, pyroclastic flows, etc. – and, most captivating, the glow of the crater after dark! The more time you allow yourself, the better your chances. Combinations with other dark destinations: none, really, that aren't in some way related to the volcano … unless you count the somewhat bizarrely oversized and over-fortified prison building in Brades. It's a high-security unit designed for up to 45 inmates – though there are hardly ever any in it … at the time of my visit, some five to eight people, mainly from Antigua, were supposedly held there, according to what locals claimed. It's a strange sight – but naturally not really visitable for tourists (unless you really misbehave, of course …). Combinations with non-dark destinations: Montserrat isn't the typical sun-beach-and-entertainment kind of Caribbean island. For a wild party scene and beach holidays you'd have to go elsewhere. In fact, the neighbouring island of Antigua is a prime example of the more prototypical Caribbean, also for those who enjoy yachting in these blue waters. And as Antigua is the departure point for flights and ferry connections to Montserrat anyway, it makes for the most obvious non-dark combination. Montserrat itself offers peace and quiet and some nice and remote nature trails instead. Diving is also an option (cf. divemontserrat.com). Nature lovers can try and seek out the elusive "national" bird (the oriole) or the endangered "mountain chicken", actually a large frog. It's called "chicken" because its meat is, or hopefully was, a prized local delicacy … now not to be had, obviously, because of conservation needs. There are few historical relics (several were destroyed by the volcano too), but you'll see the odd old sugar mill ruins. The main non-dark attraction of Montserrat in any case is the just the general atmosphere and genuine friendliness of its people. It really is quite overwhelming in the most positive sense of the word. Getting things organized and done may require a little Caribbean relaxedness … but the calm vibe of peacefulness of the place should rub off quickly – it did on me, much more that I had anticipated. In fact, I can't wait to go back!